I had mentioned in the #9 entry (Baby Driver) of my Top 10 Films of 2017 article that the unfortunate departure of writer-director Edgar Wright from the 2015 Disney-Marvel film Ant-Man “still lingers in the minds of some film buffs.” Wright had spent a decade on the project with co-writer Joe Cornish. Both ended up stepping down due to creative differences with the studio, settling with a little more than writing and story credits. Wright went on to make Baby Driver (his biggest commercial success). Meanwhile, Ant-Man’s new director Peyton Reed, new writer Adam McKay, and lead star/new co-writer Paul Rudd took the then-latest installment of the Marvel Cinematic Universe (MCU) to fair critical and commercial success in 2015. Ant-Man, as the follow-up to the dense excess of Avengers: Age of Ultron from several months earlier, earned respect for its smaller stakes (i.e., no devastated cities for once) and clever shrinking effects. That said, like Age of Ultron before it and Doctor Strange a year later, its overall plot has demonstrated such paltry memorability, save for its comedic tone and supporting star Michael Peña’s manic narrated recountings. Three years on and the sequel, Ant-Man & the Wasp, serves as the first of two sidequests during the year-long intermission established by Avengers: Infinity War (the second being next March’s Captain Marvel). Thankfully, Ant-Man & the Wasp is freed from having to reorient audiences with Ant-Man lore. The superhero blockbuster follow-up, though flawed, benefits from its constrained time setting and multiple antagonists for its heroes. Scott Lang/Ant-Man (Paul Rudd, also co-writing) is days away from completing the two years of superhero-less house arrest he was forced to serve due to the events of 2016’s Captain America: Civil War. Scott does his best on weekends to entertain his young daughter Cassie (an ever-adorable Abby Ryder Fortson). On other days, he manages the struggling security business he has started with ex-cons Luis (an excitable Michael Peña), Dave (Tip “T.I.” Harris), and Kurt (David Dastmalchian). After experiencing a bizarre vision involving a woman, Scott is kidnapped by Hope Van Dyne/Wasp (Evangeline Lilly), who leaves an ant decoy at his house to avoid arousing the suspicion of FBI agent and Scott’s overseer Jimmy Woo (Randall Park). The woman in Scott’s vision, as it turns out, is Hope’s mother Janet Van Dyne (Michelle Pfeiffer). Janet has been trapped in the subatomic quantum realm for the past thirty years. Scott had managed three years earlier (in the first Ant-Man) to enter and exit the quantum realm alive, so Hope and her father, Hank Pym (Michael Douglas), have been developing the machinery to potentially rescue Janet. However, black market dealer Sonny Burch (Walton Goggins) wants Pym and Van Dyne’s technology for greater financial gain, while the mysterious Ava Starr/Ghost (an arachnid-like Hannah John-Kamen) seeks the technology to rid herself of a painful molecular instability that allows her to phase through matter. Scott and the father-daughter engineering duo thus embark on a race against time, not just to rescue Janet, but for Scott to avoid jeopardizing his freedom right as he is about to reclaim it. Ant-Man & the Wasp spares its viewers from excess exposition involving most of its established characters. 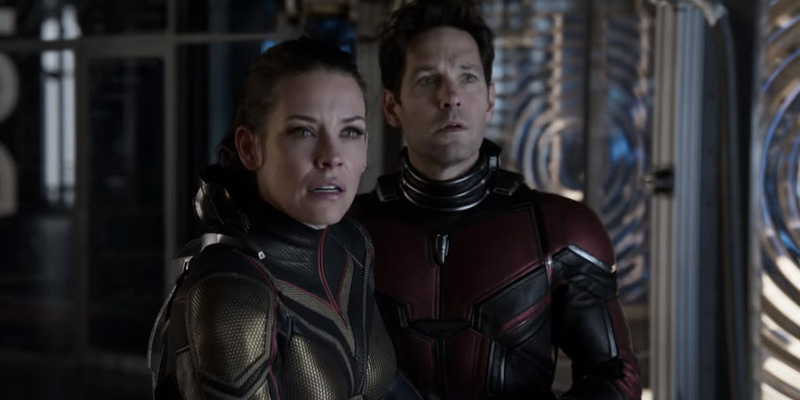 The first Ant-Man devoted some time to setting the organic sequel path of saving Janet Van Dyne from the quantum realm. Here, that setup culminates in some of the script’s more clever moments, including a most amusing scene in which Janet possesses Scott in front of Hope and Hank. It would not surprise me if director Reed and co. had Ms. Pfeiffer perform the scene first so that Rudd could match her. Elsewhere, a scene shared by Burch, his goons, and the truth serum (“It’s not truth serum!”)-injected Luis, Dave, and Kurt entertains in explaining both the origin of Scott and Luis’ friendship as well as how Scott became involved in the events of 2016’s Civil War. Beyond its impressive and dependable shrinking effects, two of Ant-Man & the Wasp’s additional strengths include its constrained time setting and its trio of opposing parties—Sonny Burch, Eva/Ghost, and Jimmy Woo. The few days remaining for Scott’s house arrest keeps audiences aware of Agent Woo. At the same time, the uncertain handful of days remaining until Eva/Ghost dies from her molecular instability pushes her harder to steal Pym and Van Dyne’s precious technology. Thus, she becomes a more formidable antagonist, even with her heavy backstory and a thankless turn by Laurence Fishburne as Pym’s estranged research partner turned Eva/Ghost’s mentor. (Interestingly, Ms. John-Kamen appeared in Ready Player One and both she and Goggins in Tomb Raider from earlier this year.) These dire circumstances are perhaps why Burch and his goons (including Divian Ladwa of 2016’s Lion fame) feel the least intimidating of the three opposing parties. It was wise for the writers to offset this by giving them an early serious scene and funnier reappearances later. Most will agree that Ant-Man & the Wasp will forever lie in the shadow of Avengers: Infinity War and Black Panther in terms of the MCU in 2018. Still, it leaves me content that a relatively light and non-origin comedic diversion, like Ant-Man & the Wasp, was just fun enough for the moment. I can forgive it for its blockbuster conveniences and for not leaving as indelible an impression as its fellow MCU installments. By electing, not for another corporate/world dominator, but for four character parties whose goals generate friction in a comedic playground lasting only one week, Ant-Man & the Wasp merits such clemency.